Lama Jigme Rinpoche | Bodhi Path Europe e.V. Lama Jigme Rinpoche was born in Kham, Eastern Tibet, in 1949. When the Chinese invaded Tibet in 1955, he moved to Tsurphu Monastery, the traditional seat of the Karmapas in Tibet, and eventually in 1959, together with the late 16th Karmapa and many other high lamas and tulkus of all ages, he moved to Rumtek, Sikkim. H.H. the 16th Karmapa founded a monastery in Rumtek in order to preserve the Karma Kagyu teachings and enable the nurturing and training of future generations of tulkus and monks. It was in Rumtek that Lama Jigme Rinpoche, along with all the regents and important tulkus, received the full transmissions directly from the Karmapa. In 1974, during his first visit to Europe, the Karmapa designated Dhagpo Kagyu Ling in Dordogne, France, to be the central European seat of his activity, headed by Lama Jigme Rinpoche as his representative. He also asked Gendün Rinpoche and Pawo Rinpoche to go there and help in bringing the 5 wishes to fruition. In addition to receiving all the main transmissions and teachings from the Karmapa, Lama Jigme Rinpoche was very close to and spent a lot of time with Gendün Rinpoche, Pawo Rinpoche, Kalu Rinpoche and Dilgo Kyentse Rinpoche; receiving many teachings and initiations from them as well. Upon appointing Lama Jigme Rinpoche as his European representative, H.H. the 16th Karmapa said: “In the person of Lama Jigme Rinpoche, I leave you my heart’. It is in this spirit that Jigme Rinpoche continues his activities in Europe, travelling extensively, visiting and teaching in different centers and inspiring all who come in contact with him. 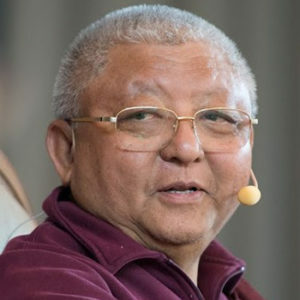 For over 30 years, Lama Jigme Rinpoche has been giving teachings and meeting with people of all cultures and background, enabling him to gain a deep understanding of westerners and developing a unique perspective on the practice of dharma in the west. It is a testament to his exceptional spiritual experience and unflinching dedication towards helping all sentient beings, which makes him a truly remarkable and widely respected Buddhist master.